Check the fluid level when the engine is at normal operating temperature. 2. Remove the bolts with a wrench, then carefully remove the under cover. 3. Remove the transmission filler bolt and washer. Carefully feel inside the bolt hole with your fingers. - Check if the fluid level is up to the edge of the bolt hole. 4. 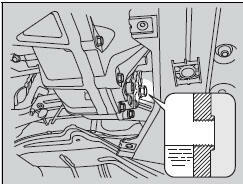 If the fluid level is not up to the edge of the bolt hole, add Acura Manual Transmission Fluid (MTF) until it runs out of the hole. 5. Put a new washer on the filler bolt, then reinstall the filler bolt. 6. 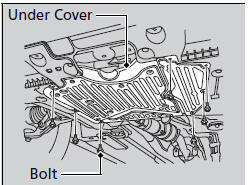 Reinstall the under cover with the bolts. If Acura MTF is not available, you may use the API certificated SAE 0W-20 or 5W-20 viscosity motor oil as a temporary measure. Replace with MTF as soon as possible. Motor oil does not contain the proper additives for the transmission and continued use can cause decreased shifting performance and lead to transmission damage.